Frequent Tuner Discounts If you have your piano tuned within six months of your last tuning appointment, you will receive a $10 discount. For those who require or desire more frequent tunings, if you have your piano tuned within two months of your last appointment, you will receive a $15 discount. For a detailed explanation of each of the services I provide, please click on the boxes to the right (below on mobile devices). Once again, thank you for choosing me to service your piano. Tuning a piano involves making very small, precise changes to the tension of all the piano’s 220 or more strings in order to bring them into harmony with each other. Each piano string is connected to a tuning pin, which is turned and manipulated by the piano tuner to achieve a fine tuning. The vibrational interaction among the tones will be different for each piano, which necessitates a unique tuning for every instrument. If a piano has not been regularly serviced to keep it at correct pitch, it will likely require a pitch correction, or “pitch raise,” before it can be tuned. A pitch correction is a preliminary tuning of all the 220 or more strings of a piano in order to bring them to the correct average tension level so that the small changes necessary for a fine tuning are possible. For more information on pitch raising, see the Piano Technicians Guild Technical Bulletin #1. Regulating a piano involves the adjustment of the mechanical aspects of the piano to achieve uniform touch and responsiveness, and wide dynamic range. For more information, see the PTG Technical Bulletin #2. 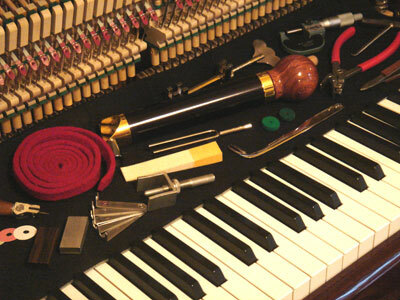 Worn or broken parts of a piano’s action, keyboard, pedal system, or damper system can often be corrected on-site. If your piano needs a major structural repair, refinishing work, or another type of service that cannot be performed in the home, I can refer you to a qualified rebuilding shop that will be able to help you. The large seasonal changes in humidity levels in the Chicago area are a major factor causing pianos to go out of tune. The wooden parts of a piano, especially the soundboard and bridges, will expand and contract with changes in relative humidity, and the piano’s pitch will rise when the wood swells and drop when the wood shrinks. The touch of the keyboard and the functioning of the mechanical aspects of the piano may also be affected. I recommend the Dampp-Chaser Piano Life Saver humidity control system, which is installed in the piano itself, to moderate these seasonal changes. The system consists of a humidifier, a dehumidifier, and a humidistat that controls the amount of moisture added or removed from the air in response to changes in relative humidity. For more on humidity and pianos, see the PTG Technical Bulletin #3. More information on the Piano Life Saver System can be found at the Dampp-Chaser website. I am a Certified Installer of the Piano Life Saver System. Voicing is the process of modifying or adjusting the tone of a piano. It involves shaping the hammers, ensuring the hammers hit the strings squarely, and evening out tonal differences among a group of notes. In some cases it involves making the tone of the entire range of the piano louder or quieter, more bright or less bright, stronger or less strident. For more on voicing, see the PTG Technical Bulletin #4. Touch weight analysis involves investigating why the feel of a piano may be too heavy or too light, too stiff or too loose. Addressing touch weight problems may involve correcting friction in the keys and action, adjusting misaligned parts, or, in some cases, replacement of parts.